I told him I wanted to save the world, and he pointed me in the right direction.” — says Peterson of his professor, Joseph Smith. During the 2010 season, Peterson, a 2007 chemical engineering graduate, tore the anterior cruciate ligament (ACL) in his left knee. After a year of rehabilitation, he was ready to get back on the field. “I’ve never been so happy to get back on the treadmill and train,” says Peterson. However, fate had a different plan. On the fourth day of fall camp, Peterson’s season ended early yet again after he tore the ACL in his right knee. Dealing with such injuries “puts things in perspective for you,” he says. 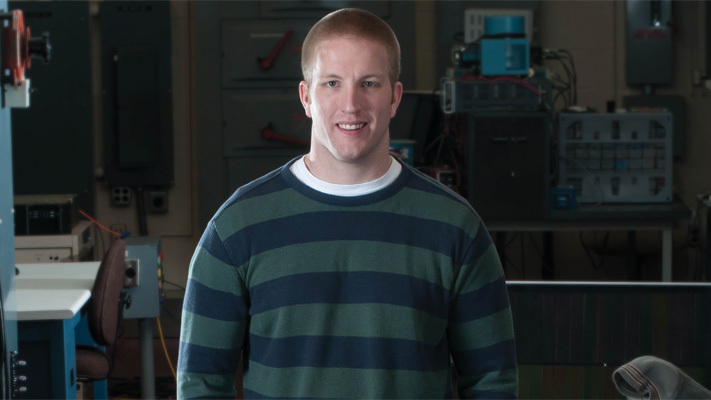 Peterson is pursuing his master’s degree now, studying electrical and solar details of energy storage and renewability. “Hybrid energy is the future,” he explains. “It’s a more advanced, dispatchable form of energy. Solar energy is far more viable and widespread, though it could take years for application on a larger scale.” Peterson’s enthusiasm and dedication to his research is nothing short of what someone would expect when meeting him. “I have to make the most of my opportunities, and when I commit, I commit 100 percent,” he says. He certainly is sharp. Brian’s team of two won our final Einstein Bros Darn Good Trivia of the semester last Friday in Havener Center!